Graeme McDowell's missed cut in the Abu Dhabi HSBC Championship means he has slipped out of the top 200 in the Official World Golf Ranking for the first time since April 2004. The 2010 US Open champion, who rose as high as world No 4 in January 2011, fell 13 places to 202nd in the latest list and was the first reserve for this week's Omega Dubai Desert Classic. McDowell was ranked 241st in the world early in 2004 following a disappointing 2003 season. But he won the 61st Telecom Italia Open (and his weight in Parmesan cheese) when he beat Thomas Levet at the fourth extra hole at Castella di Tolcinasco near Milan. It was his first win since he broke through to claim the 2002 Volvo Scandinavian Masters, just two months after turning professional, in just his fourth European Tour start. But he has yet to win since he claimed the OHL Classic at Mayakoba in November 2015. Jon Rahm moved up two places to world No 2 following his playoff win over Andrew Landry in the Career Builder Challenge in Palm Springs but Rory McIlroy remained 11th as Tommy Fleetwood moved up six places to 12th following his successful defence of the Abu Dhabi HSBC Championship. Graeme McDowell is on such a massive high that he’s already set his sights on chasing down Lee Westwood for the world No 1 spot. 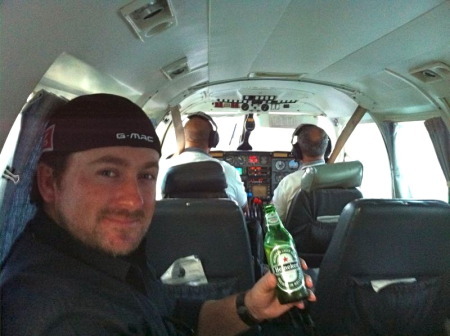 Flying high: Graeme McDowell celebrates his closing 62 with a well-deserved beer.Graeme McDowell headed to Hawaii last week determined to prove that his rise to world No 5 was no flash in the pan. The result? Third place in the Hyundai Tournament of Champions following a course record-equalling, 11-under par 62 in the final round that sees him threaten to overtake Phil Mickelson at world No 4.